For its position protected by Lattari Mountains and its beauty Positano was known as since the Roman epoque as demonstrated by the rests of some Roman villas. 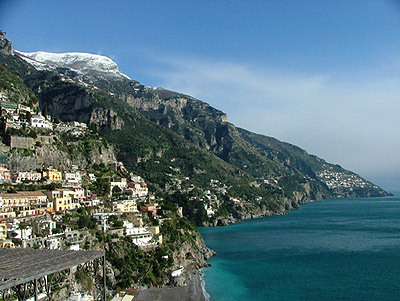 During the Middle Ages Positano suffered for several Saracens' invasions that obligated the population to shelter itself in upper place on the hill and build the villages of Montepertuso and Nocelle. Three sighting tower built during this period are still present today: Fornillo, Trasita and Sponda Towers. The village passed then under the influence of Amalfi republic becoming an important port and followed later the same history of Naples until the moment of its annexation to the Reign of Italy. Worthy of a visit the church of Madonna dell'Assunta (XII sec. a.D.) who here is celebrated every year the 15th of August.